It’s 1915, and Bess Heath is a happy, well-to-do student at Loretto Academy, a Catholic school on a bluff in Niagara Falls, Canada. Her window looks out toward the falls, and she imagines that the flecks of silver she sees in the mist are prayers. When her father loses his job at the Niagara Power Company, her family begins a descent that seems to lead only to tragedy. Bess’s newfound love for Tom Cole, a riverman, raises Bess’ spirits, but her family was hoping for her to find a connection that would raise their fortunes. At first glance, The Day the Falls Stood Still by Cathy Marie Buchanan looked like nothing more than a story of young lovers against the world. You know the story—the well-heeled young woman and the rough-hewn young man and all the people who try to keep them apart. I like to read such stories now and then, but they rarely rank among my favorites. The idea of love presented is usually so romanticized, so far from reality, that I can never fully buy into the story. Buchanan’s book, however, is something more. The predictable romance I was expecting turned into a story of grown-up love. It’s a love that faces conflict from outside, but also from within, as Bess must weigh her own pragmatic desire for food on the table and a roof over her head with her unexplainable attraction to Tom. At heart, this is a book about faith—in ourselves, in our loved ones, in our ancestors, in nature, in God. Bess begins the novel as someone who believes in prayer, but when tragedy strikes, she cannot see anything beyond the immediate troubles around her. Tom, who has an almost spiritual connection to the river, tells Bess that the loved ones she has lost are still with her and encourages her to take heart in that knowledge. It is Tom’s own connection to his ancestors—especially his grandfather, the legendary riverman Fergus Cole—that helps him to make daring rescues and recover bodies that have become lost in the whirlpools at the falls. I liked the characters Buchanan created. They felt authentic and well-rounded. The heroes aren’t perfect, and the villains aren’t evil. They’re mostly just people doing the best they can to navigate the world. Some of them have preconceptions or biases that lead them to make poor choices, but they’re generally not mean-spirited. The setting is even more of a treat than the characters. I’ve visited Niagara Falls, and the power of the falls is unforgettable. Buchanan sets her book in an interesting place and at an interesting time. In the early 20th century, power companies were using so much water from the river that the river itself was sinking, and the rock wall behind the falls was becoming visible at times. Tom, with his connection to the river, is deeply troubled by this, and he observes the river closely for changes. Bess, on the other hand, sees the potential benefits of electricity and wonders if the falls are really that important. Today, the answer to the dilemma seems obvious; of course, something as magnificent as Niagara Falls must be preserved. But if I put myself in Bess’s place and consider choosing between having an electric stove and having a dangerously powerful river right outside my door, it looks a little different. 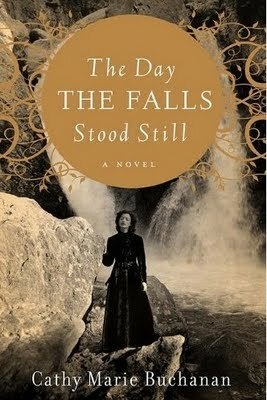 The Day the Falls Stood Still is Buchanan’s first novel, and I’m pleased to say that it doesn’t have the problems that I’ve found in so many first novels. She doesn’t try to pack in too much plot or play around too much with language. The story and the story-telling are direct and clear. The prose may not achieve great heights of beauty, but it’s never overwrought or awkward. The story doesn’t take any huge risks, but it was interesting and layered enough to hold my attention and keep me wondering what was going to happen. It’s a good, solid read, and I thoroughly enjoyed it. A fine debut. See additional reviews at The Indextrious Reader, Linus’s Blanket, Savvy Verse and Wit, and Bibliophile by the Sea. This entry was posted in Fiction, Historical Fiction and tagged Review Copy. Bookmark the permalink. I’m glad to hear that this is a “good, solid” debut. I saw it a couple of weeks ago at B&N for 50% off the hardcover and so I grabbed it. I bought this when it first came out as it sounded like something I would like. And I’ve heard very good things about it since–can’t wait to get to this one. Thanks for for this very nicely done review of my debut. As a writer it is such an honour to have your work so thoughtfully considered. I’m going to post it on my facebook fanpage. Glad you made it to Niagara. Yours is the first review that’s made me want to read this book! And I had been so pleased with myself for not being drawn in by every shiny new book to hit the shelves. :P Adding to the list. Kristen M.: I got this as a review copy from LibraryThing, but I certainly wouldn’t be disappointed with paying half the cover price. It’s well worth that. Danielle: I think you would like this. Seems like your kind of book. Cathy: Thanks so much for reading my review–and for writing such an enjoyable book. It really was a pleasure to read! Jenny: I wasn’t sure about this one at all; I was afraid it would be overly simplistic, melodramatic, and predictable–like so much popular historical fiction. I was just curious enough about the setting to request it from LibraryThing, and I’m glad now that I did. This sounds really interesting. I do love the idea of a romance that is not sappy but genuine and real. There’s so much potential in the reality of love as it is lived – why spoil it with implausibility and convoluted plots? litlove: I was pleased with the focus on the characters’ dueling priorities and how they changed over time. And then to set it against such an interesting backdrop made it a real pleasure.